The basic rules of volleyball are well-known in terms of legal and illegal hits. However, there are special situations that have led to the creation of new rules to define what is and is not an acceptable hit. 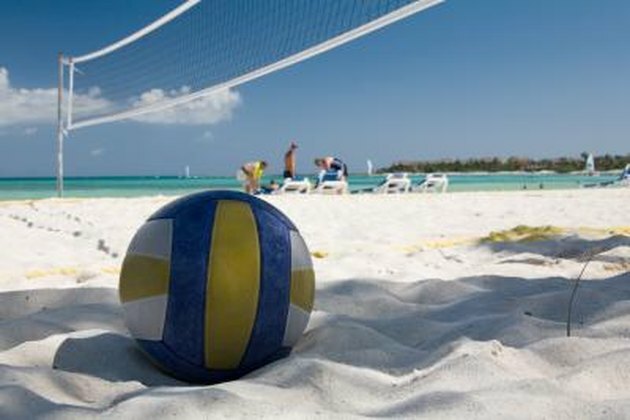 Volleyball rules are promulgated by the Federation Internationale de Volleyball on the international level and the NCAA, USA Volleyball and the National Federation of High School Associations in America. The rules are essentially the same on the high school, college and international levels. You can't catch or hold the ball in regulation volleyball. To insure that the ball is not held for a split second on scoop shots, you can't use open palms beneath the ball to hit it. You can't throw the ball either. Double hits are an example of a special situation. Double hits are legal only on a team's first contact, such as digging out a serve, but illegal on subsequent hits. Hits can be legal or illegal, depending on the situation. For example, a team can only hit the ball three times before it must go over the net to the opponent's side. A fourth hit is illegal. However, a block does not constitute a hit, so in that situation a team can block a shot and then hit it three more times. A ball that hits the net is live and still in action. That applies to serves as well. Serves can't be hit or blocked by the front line. Apart from the serve, you can't attack a ball coming over the net until it has broken the plane of the net. However, you can break the plane of the net after the opponents have completed their attack by using up their three hits. Although you can't hit the ceiling with your serve, hitting the ceiling with any other shot that goes into the opponent's court is allowed under high school or college rules in the United States. Contacting the ball with any part of the body below the waist used to be illegal. When the ball hits any part of your body, including the leg or the foot, it constitutes a legal hit. Another USA Volleyball rule update for the 2010 season slightly changed the rule regarding physical support for a teammate. Previously you couldn't get a teammate's help to reach a ball. Now you can't get a teammate's help to hit the ball, although it is still legal for a teammate to stop you or hold you back from touching the net or crossing the center line.